Nose to the grindstone! Last time, we talked about your Reading List. Today we’ll be discussing a very cool new feature of Protagonize 2.0, the ability to embed media into works and pages. 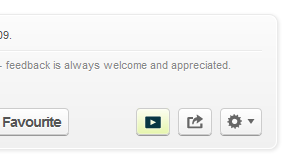 You may not have noticed this feature yet, but there are already a few of you who’ve started using it. What’s this about “embedding” stuff? Media embedding, you say? Let me explain. Something I’ve always thought would be helpful and entertaining on Protagonize would be to allow audio and video files to be attached to works or pages within them. So while working on the new site, I took the time to devise a way to make this happen. What this means is that authors can now embed or attach audio and video files to works or individual pages, depending on the original work’s settings. The work’s primary author can determine whether or not media embedding is allowed, and who can add media. What exactly can be embedded? Both audio and video clips can be embedded, but they need to be hosted elsewhere. I didn’t think re-inventing the wheel was in order here, so we only allow you to embed clips hosted on larger media hosting sites. For now, we’re restricting things to three major sites: YouTube and Vimeo (video), and Soundcloud (audio). We may add more later, based on user request, as long as they support the oEmbed format for standardized media embedding. The other neat thing is that you can choose a label for the media you’re adding — it can be inspiration, a reading of the work, a soundtrack, or you can choose from various other options (see above.) The label you select will be displayed above the embedded clip when viewing the attached page. So, how do you embed media? Well, first of all, the original author of the work has to allow you to do so. 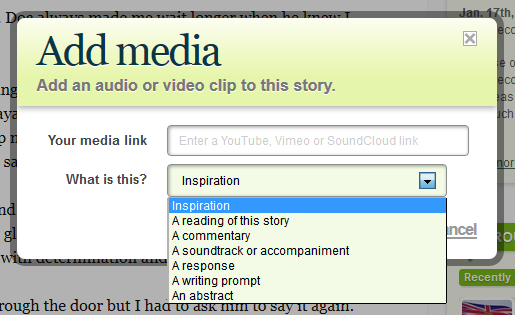 This is done via the Work Options dialog (see above) — by default, any participant in the work can add media, but the primary author can choose to restrict this to only themselves, or nobody. Assuming you have permission to add media, there’s a button on the byline box (see right) on each page in a work that allows you to trigger the Add Media dialog (see above.) Then it’s just a matter of pasting in a link to the video or audio clip you want to embed, and hitting Save. You can always edit or remove the attached media by clicking the Edit Media Settings link directly above the clip. Also, the work’s original author can edit or remove media clips on any page in their work, so they retain control if someone adds something they don’t like. Note: I realize some of you are going to ask about embedding static images like photos or illustrations in your works and pages, but that’s something we’re going to do differently down the road, and will be tied into the Protagonize Plus account upgrade. This option is strictly for audio/video accompaniment. Have any questions about adding media? Want to show off some creative uses of embedding? Feel free to ask or let us know in the comments. This entry was posted in General, Site mechanics, Tutorials & Walkthroughs and tagged audio. video, Features, media, media embedding, overview, protagonize 2.0, redesign, walkthrough. Bookmark the permalink. This looks really good! I cannot wait to use it in future posts! I love this feature- but does the final paragraph mean that embedding static images will only be available to Plus account users? I would have thought that more users would want to embed images rather than media. Single cover images will eventually be available to all users, but chapter/page images will be limited to Plus accounts due to file storage requirements to help defray the hosting costs (somebody has to pay for it, unfortunately). Both image types will use a different system than media embedding, though, as they’ll actually be inline in the content and not in the sidebar. Ah, I’d love to be able to add pictures and covers (illustrations of the book) and am disappointed that this feature will only be available for upgraded users. I would be over-joyed if one more sensational website would offer this for free, to show the high level of creativity and art that this community possesses. I know of only one website which does this and it is very successful. Though, this idea of embedding audio and video is not quite original (which means I’ve seen it before) it is still an excellent idea. Please see my response to Angel above as it should answer your question, too.